A hallmark barbecue cut, brisket benefits from slow and low cooking, which turns its toughness and sinewy texture into buttery slices. Tri-tips are also often used in barbecue but come from the opposite side of the animal. They yield slices with a beefy flavor and a slightly chewy texture. Which cut you choose to cook really depends on the flavor and texture you desire; the amount of meat you want to serve; and the method of cooking. A large piece of muscle from the chest of the cow, the brisket features a thick fat cap that melts slowly as the brisket cooks, to increase moistness and flavor. Purchase brisket in flats or points at meat markets or the grocery store. The flat is the thicker and leaner portion of the cut, while the point is the thinner and fattier option. The only viable way to cook brisket is in a braise -- as in popular corned beef, pot-style or barbecue. Any other cooking method yields chewy, fatty and unpleasant meat. Beef tri-tip come from the back of the cow, at the lower portion of the prized sirloin region. Texan chefs don't use tri-tips a lot in grilling, but BBQ fans in the Rocky Mountain West do. 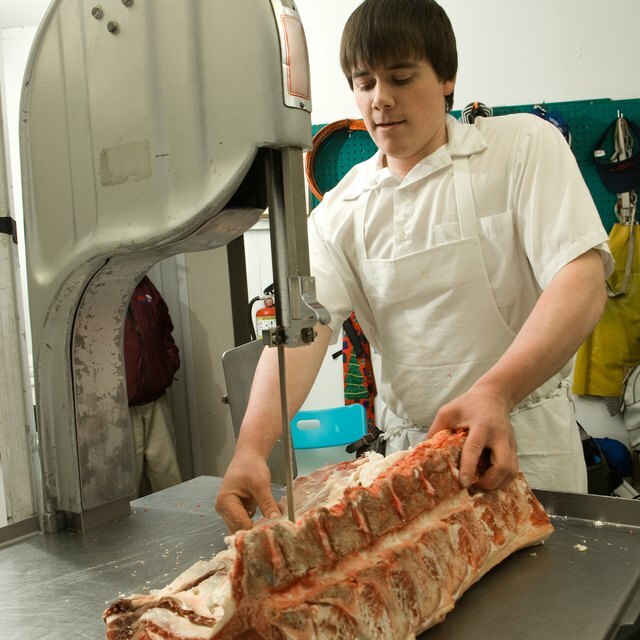 It's basically the tensor fasciae latae muscle, and all the fibers run in the same direction -- making for easy carving against the grain and a relatively tender bite of beef. You'll find tri-tips with a fat cover or ones with the fat removed so only the lean muscle shows. A fatty cut is the best choice for long, slow barbecue, while a lean cut grills well. Unlike brisket, you can cook a tri-tip to rare or medium and still have a tender, delicious piece of meat. Compared to brisket, tri-tips come in smaller sizes of about 2 to 3 pounds -- briskets can be 8 to 11 pounds -- and is usually triangular in shape. Why Does My Pork Roast Come Out Dry?